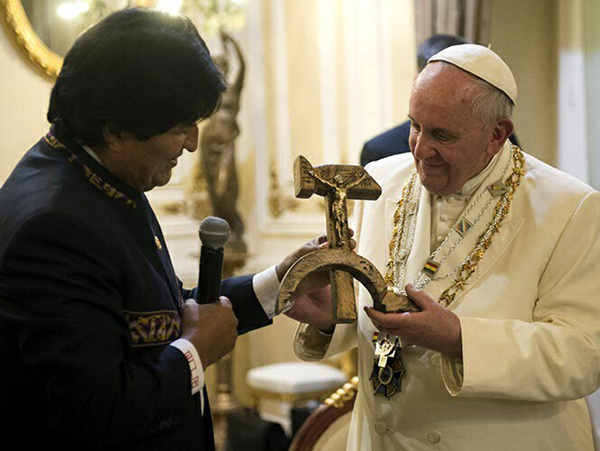 On July 8, 2015, Pope Francis received a crucifix on a hammer & sickle, the communist symbol, from President Evo Morales of Bolivia. As soon as the scandalous photos, like the one above, started to circulate, a loud chorus of middle-of-the-road interpreters – the best anesthetic for a revolutionary shock – entered into action, spreading that Francis was tricked by Morales and did not approve of the initiative. This purely and simply is not true. First, because anyone who knows about Vatican diplomacy is aware that every step of a papal visit is meticulously prepared in advance down to the last detail. These steps obviously include the gifts given and the speeches delivered. So, there was no surprise for Francis. Second, the sequence of photos reflecting the reactions of Francis to the hammer & sickle crucifix – see the second to the fifth rows – demonstrates that he only displayed a momentary concern, first row below; then he became completely relaxed and smiled amiably as he held the communist symbol. Therefore, the Pope was perfectly aware of what he was receiving and was quite pleased with that symbol. Further, Evo Morales also gave the Pope a collar of the so-called Espinal Order, an order of the government in honor of Luis Espinal. Espinal was a Spaniard Jesuit who went to Bolivia to lead a fight for the "liberation of the people." He ended by being killed by an unknown group. Hanging from the collar is a medal with a similar crucifix on a hammer & sickle – rows sixth to eight. In the ninth row is a photo of Fr. Luis Espinal, who designed the controversial cross. Adding to the ensemble, it is good to remember that on his way to the Government Palace, Pope Francis stopped to pray at the site where the body of Fr. Espinal was found dead – rows eight to twelve. Is he not a communist himself?